For this February 2018 Gobble review, we tried three meals and chocolate chip cookies! 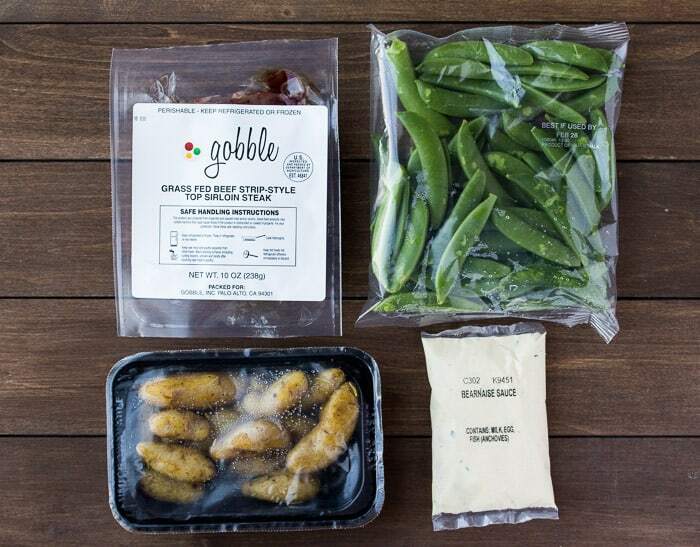 Gobble is another meal kit delivery service. 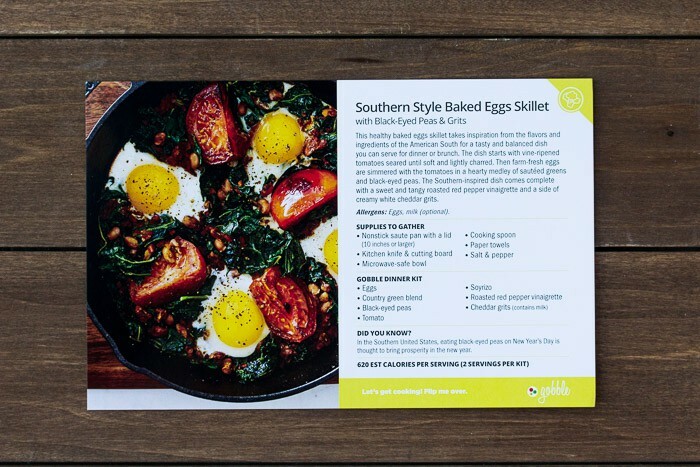 If you are a regular visitor to Delicious Little Bites, you’re probably aware that I am no stranger to meal kit subscriptions. I’ve tried quite a few and have almost always loved them, or at least really liked them. 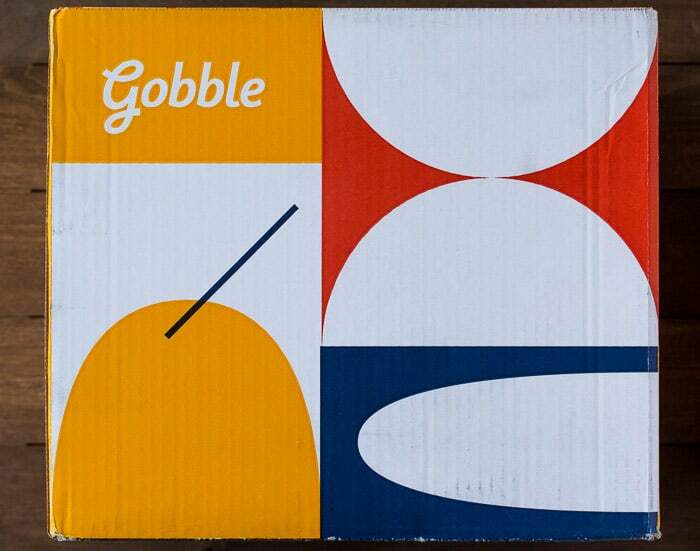 Unfortunately, Gobble didn’t win me over. Let’s begin with what makes Gobble unique. They claim that their meals can be made in 15 minutes and with one pan. Sounds good. They also offer a variety of meals to choose from, with the ability to skip weeks, just as most of these types of subscriptions do. Here is where my trouble began. Before signing up for Gobble, I checked out the “Upcoming Menu” tab on their homepage. There are approximately 90 different recipes shown. They are not separated by week. I was under the impression that there would be a larger selection of recipes each week, maybe similar to Terra’s Kitchen. However, once I signed up and could see the actual weekly menu, that wasn’t the case. I also found out that the only nutritional information given besides allergies, is approximate calories. Because, I have been trying to eat lower carb meals this month, the lack of information really threw me off. I ended up selected 3 recipes that I thought might be okay for my diet. The recipes sounded like something I would like, but I just wasn’t really thrilled about any of them. I have found from other food subscriptions that sometimes something that doesn’t sound amazing can actually turn out to be the best, so I went for it with high hopes! 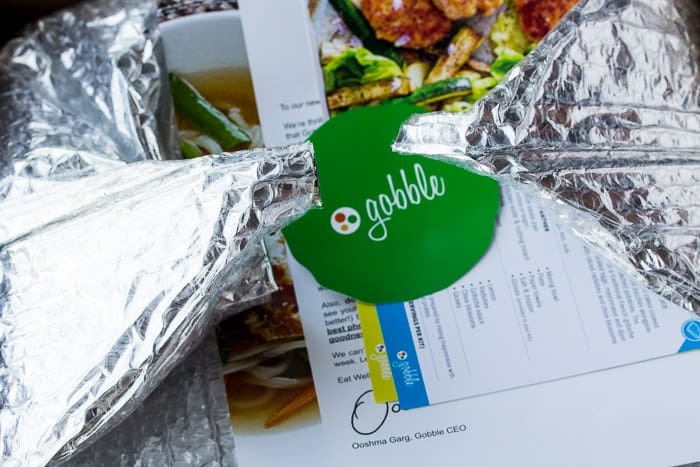 Gobble offers delivery on certain days but lets you choose which of those days of the week delivery works best. I could choose from Wednesday, Thursday, and Friday. 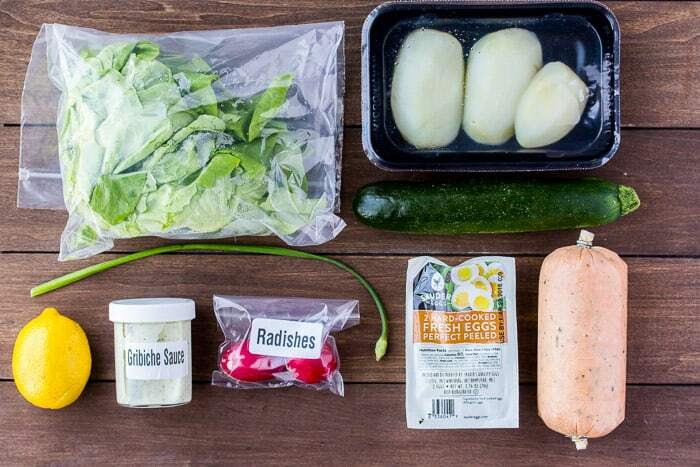 Every other meal kit subscription I have tried so far also offered Tuesday. That’s usually the day I choose so that I can eat the meals for lunch during the week. My delivery did arrive as expected. The packaging was typical of that of just about every other meal kit subscription I have ever ordered. 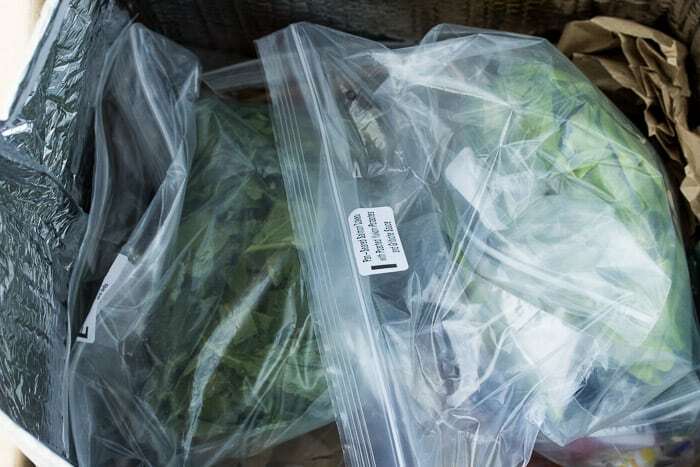 Meals are separated into large resealable bags surrounded by plenty of insulation and a huge ice pack at the bottom where the proteins are kept separate. All the food was fresh and there was no damage to any of the items. The eggs were each individually wrapped in bubble wrap inside of a plastic container. There are recipe cards with cooking instructions for each meal. Gobble included 2 complimentary chocolate chip cookies with my first order, as well! I’m planning to switch things up next month and follow a vegetarian diet, so I ordered this vegetarian recipe because I was intrigued by the soyrizo. I read the ingredients list for chorizo once and refuse to eat it, so I was looking forward to trying a vegetarian version! Including prep time, this recipe did take a little longer than 15 minutes, but it was straightforward and easy. The grits where already prepared and just needed to be heated in the microwave. The rest of the recipe only required some minimal work. Once prepared, I quickly learned that I did not like the bitter taste of the greens. My fiancé makes us collard greens every once in awhile, but uses other ingredients that must take the bitterness out. 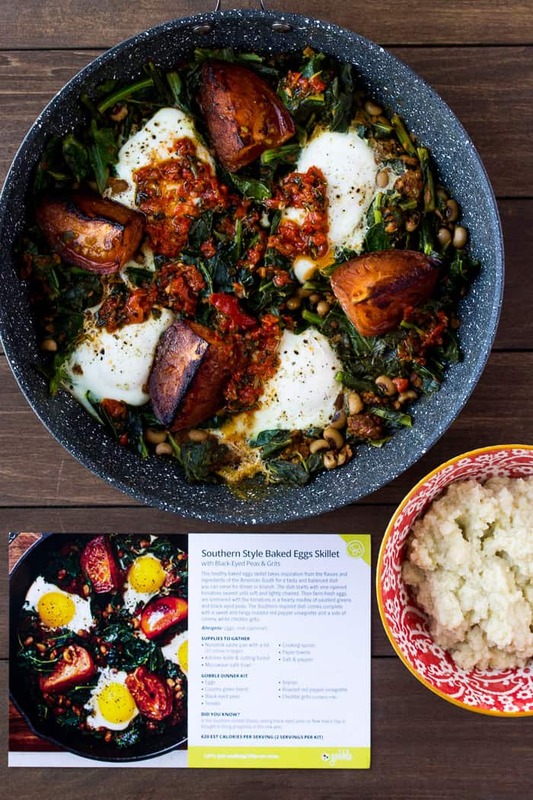 Unfortunately, because this skillet is all mixed together, and there was a lot of greens, it was hard to pick through to get to the “good stuff.” I did like all the other aspects of this recipe though, including the grits. 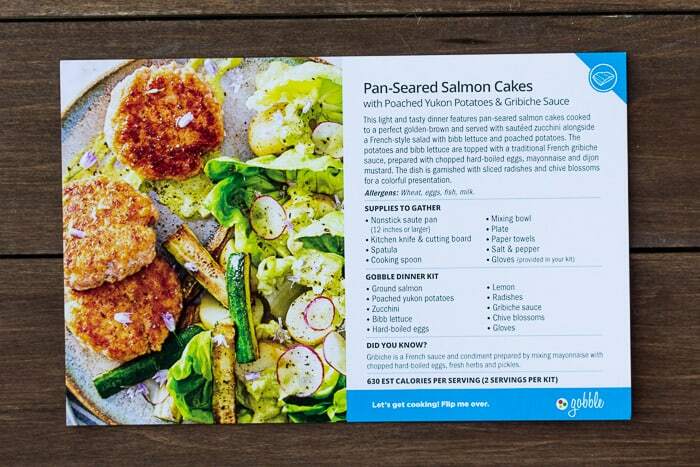 I don’t usually order fish dishes from meal kit subscriptions, but felt this was probably the lowest carb meal on their menu. 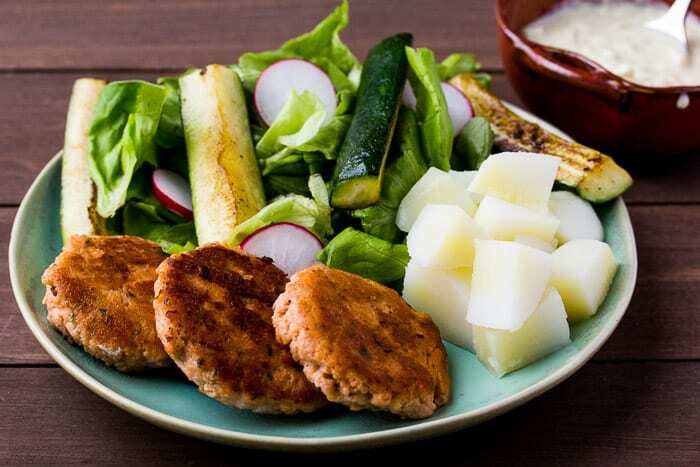 I also have a salmon cakes recipe of my own, so I really thought I would like this recipe. I’m not sure if the ground salmon had anything additional in it, but I found it to be a little too “fishy” tasting. Salmon is always hit or miss and this one was just a miss for me. I ate one salmon cake and the rest ended up going to waste. The salad was good. The zucchini, which I usually find plain, was actually my favorite part of this whole meal, especially when dipped into the Gribiche Sauce. I didn’t think I would enjoy the sauce which is a mayonnaise and herb sauce mixed with chopped hard boiled eggs, but it was okay. This recipe took me close to 25 minutes to make. A few other things to note about this recipe. One, my poached potatoes didn’t have skin on them like in Gobble’s recipe photo. Also, the chive blossom in their photo is a purple flower with plenty of petals to decorate the dish. I was curious as to whether or not I would enjoy eating a flower, but I didn’t have the opportunity to find out like I should have. 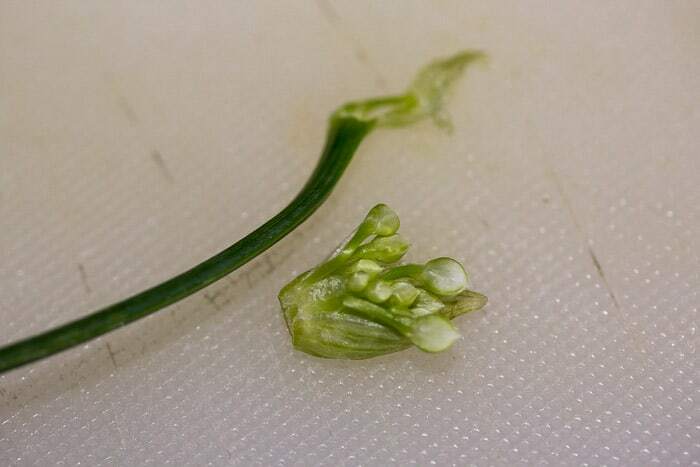 My chive blossom was just a bud. I cut it open hoping there might be a few petals inside, but no. I think that maybe this recipe was a little too ambitious of Gobble. I’m sure estimating when a bud will open and have petals is extremely difficult to do! I chose this last recipe because even though it contains potatoes, similar meals from other meal kit subscriptions have estimated the carbs to be somewhat reasonable. I assume this is because the potatoes are the only real carb-filled ingredient. There were only 4 ingredients for this recipe because the sauce came pre-made. Including the time it took my oven to preheat, this recipe took me around 20 minutes to make. First, the potatoes were delicious. I also enjoyed the snap peas and the Bearnaise Sauce. My fiancé, who eats pretty much anything, did not care for the peas. Now, the steak. 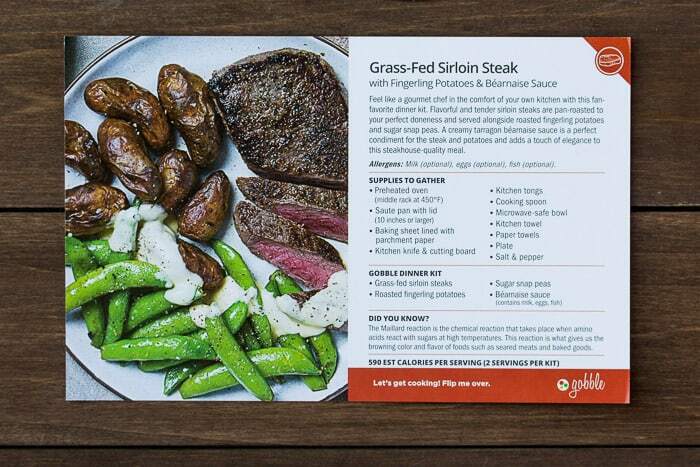 I typically find that even though the steaks are small in these meal kits (because they are the suggested serving size that very few American’s actually eat), they are still high quality. Again, this was not the case with Gobble. Usually the steaks that come in meal kits are estimated to be 6 ounces each. Gobble sent 10 ounces total, so about 5 ounces each, but they were definitely not even-sized steaks. Before cooking the steaks, I cut off some of the excess fat, but there was quite a bit. One of the steaks was very thin (as seen in the photo) and the other was thicker, making them impossible to cook evenly together. After cutting around the fat, I ate about half my steak before I just gave up. My meat-loving fiancé, started cutting into his and said that is was a terrible cut of steak and really tough. 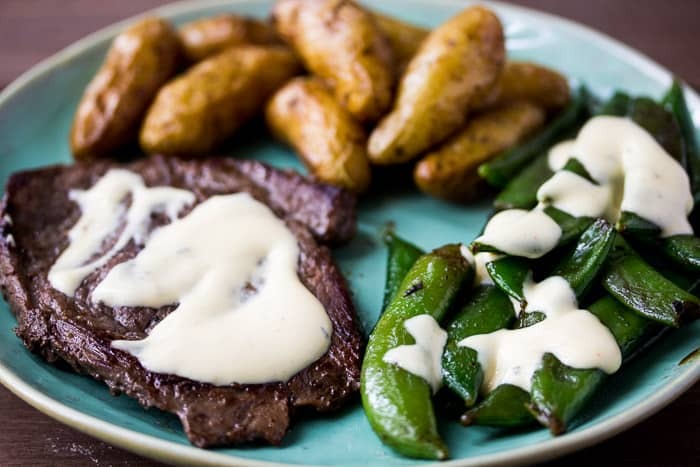 He’s never complained about any other steaks we’ve gotten from these meal kits, but actually got up and threw his away along with his snap peas. Gobble offers several add-ons including drink mixes and cookie dough. They sent 2 complimentary chocolate chip cookies. 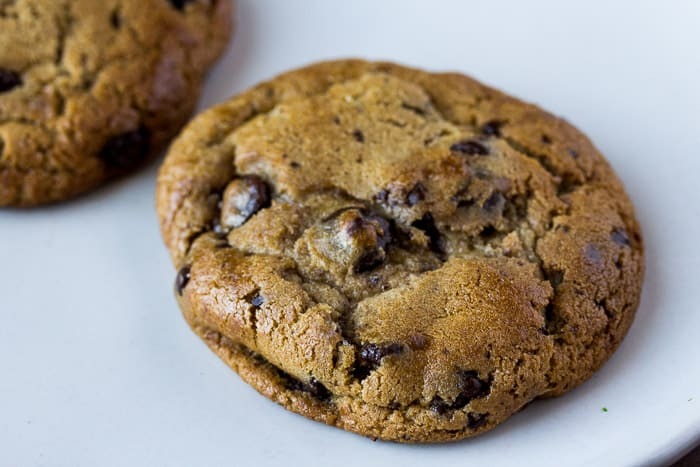 I’m not sure if this is something they do with every order, or just the first one as a way for you to try the cookies…and who doesn’t love freshly baked, warm cookies? My son loved them, and I thought they were good, but not so amazing I would want to order them again. I am usually very forgiving when it comes to these kinds of things because taste is always a matter of opinion. With the skillet recipe, it was definitely just a matter of personal taste. Had I liked the greens, that recipe would have been great. However, that’s not the case with very fishy tasting salmon, an ingredient that couldn’t be used as intended, and poor quality steaks. Thankfully, due to a huge discount on my first (and only) order, this box only cost me $21.00 instead of $71.00, but I still felt like it was a waste. The content in this February 2018 Gobble review is of my own experience and opinions. I have seen plenty of other reviews of this service and some people really enjoy it! Normally, I would include a referral or affiliate link to Gobble here with the discount to try it, but I’m not going to do that. I am not recommending this service at this time. Should you decide it might still be for you, I would suggest that you visit other reviews and use one of their referral links or just go to www.Gobble.com and see if they have any offers for first time subscribers on their homepage. Sun Basket – mostly organic, very flavorful recipes that cater to a lot of different diets as well – I LOVE it! All of the above links will give you a significant discount if you are a new customer. 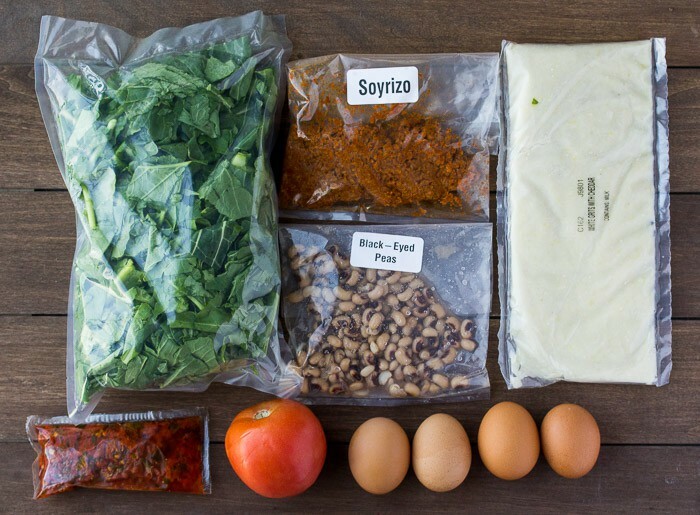 If you’d like to see a break down of the top 10 meal kits available, plus all the recent first time subscriber discounts, be sure to check out my Ultimate Meal Kit Guide.